Sam Anderson and Rosemari Mealy visited Montreal to take part in a symposium last September. This two-day symposium coincided with, and commemorated, the thirty-sixth year anniversary of the Sabra and Shatila massacre of Palestinian refugees and displaced Lebanese following the 1982 Israeli invasion of Lebanon. It aimed to remember and honour its victims and to work to build knowledge about women and war. Sam and Rosemari were part of a roundtable panel called “Black and Puerto Rican Solidarity with Palestine.” They outlined their various activism in the context of Palestine, while emphasizing the indivisibility of solidarity across different communities. 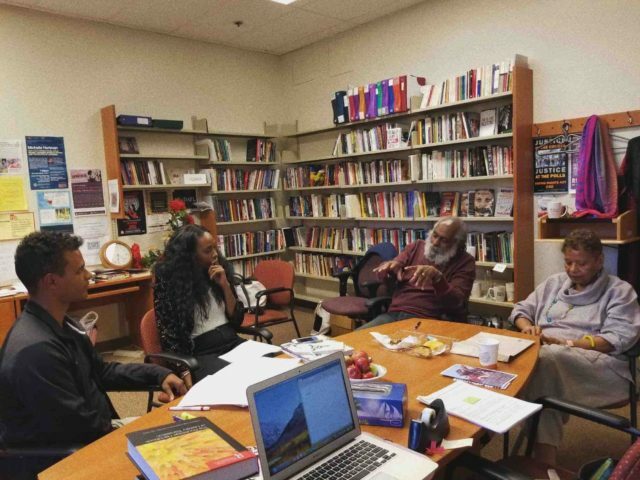 Sam Anderson is a retired mathematics and Black history professor who has been active in the Civil Rights and Black Liberation movements since 1964. Being a member of Student Nonviolent Coordinating Committee (SNCC) and a founding member of the Black Panther Party has allowed him to combine his decades-long activism with his scholastic work. Rosemari Mealy is a writer and an educator who was also an original member of the Black Panther Party. Mealy has organized events, programs and rallies which provided necessary gender and queer analyses within the Black Panther movement. She is also an activist in the International Human Rights and Political Prisoner movement. 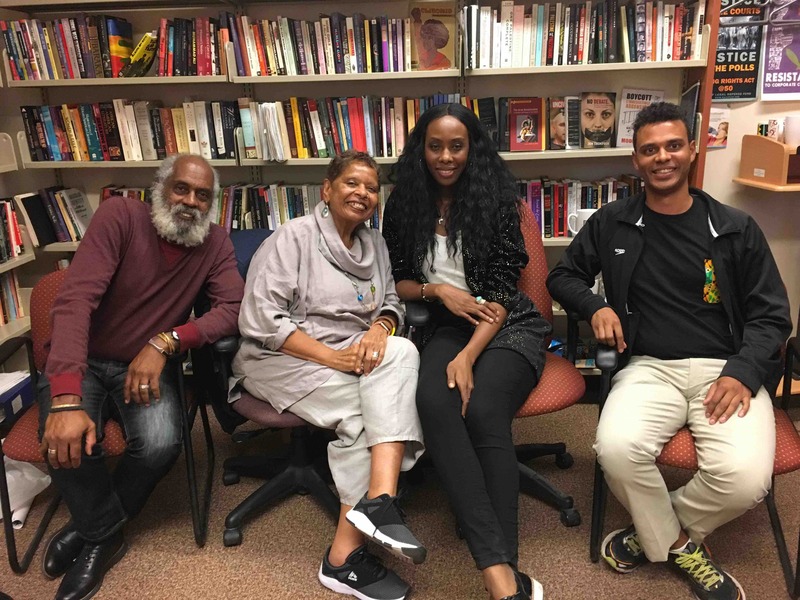 Sandrine Appiah and Clement Bélanger Bishinga (who are members of the Students of Colour at McGill support group on Facebook) sat down with Sam and Rosemari to have a discussion on intergenerational activism, feminism, and the pitfalls of contemporary activism. Sandrine Appiah: We wanted to start this interview by showing you both the “Black Lives Shattered” video from the artist Panther. One of his lyrics states, “I can see your stress is in the red / come thru I can give you rest / sit down take a deep breath / maybe we can help each other heal from this.” Artists like Panther are conveying specific messages through YouTube and social media to alert others and bring awareness to social issues, and are using these social media platforms as a way to call people into a particular struggle. Do you think social media hinders the truth on some of the issues prevalent in the world? Particularly because of the way in which many of these messages keep getting labeled as “fake news” by people like Donald Trump as a way to deflect the intended message. Rosemari Mealy: I think that those who are using social media as a platform for social justice need to be more in control of their content. Because the problem is, if you don’t have control of your content, then you lose the power of the message. I think that the younger hip-hop artists are sometimes afraid to cross the line because they’re afraid that their honest and intended message will be twisted. Many revolutionary artists were not afraid to identify the economic rationale and reasoning to explain the conditions of oppression, or to describe why we are in a particular drastic situation. Nowadays, people are not really addressing the conditions that created the problem; they focus on the problem itself. Therefore, the ideological component, the fundamental reasoning and the illogical basis for why we are oppressed, is often lost. Framing is important, and we have to address the cause of the problem for people to understand the result of the problem. Sam Anderson: Right, another problem is that social media makes everything equal, and with equal access to social media, anyone can say anything they want (even if it may not be necessarily true). If you aren’t able to mentally distinguish anomalies yourself, or are not curious enough to doubt everything that is said to you, it’s easy for you to believe what’s being fed to you. Appiah: It is their reality versus your reality. Anderson: The conflation of both realities is one of the challenges with social media. Another one is that the younger generation, particularly in the US, have gone through a public school system that destroys critical thinking skills. And on top of that, [the education system is] anti-historical. So people watching Panther’s video, or watching the video of a racist incident happening on Facebook, or seeing images from the 1960s, aren’t given any historical context to it. It’s just boom! An image here, an image there. Then you might see an image of a Black Panther, with the beret and fists, but there’s no context to it. And they don’t even know that there is no context. They just see these pictures and they don’t know what to do with them[…] I’m not saying that videos like Panther’s “Black Lives Shattered” is a kind of propaganda, but rather I’m making the argument that the typical young Black person who is between 17 and 21 in the U.S. isn’t going to know that legacy. Their legacy. Precisely because of the levels of miseducation that exist. This often results in popular and highly political hip hop music /content that is often taken out of context, which is frustrating. It’s important to highlight this in order to truly understand the meaning of these images. But we, as ancient people, we get it. We’ve seen it. We’ve lived that. Appiah: You talked about power. Do you feel that groups like Black Lives Matter (BLM) today, have the same effect or stance as the activism you partook in back then? Do you feel like your activism was more powerful and impactful than activism today? Mealy: It’s important to know that we were just one component of the broader struggle that was taking place. For many, the starting point for Black struggle starts with the Black Panther […] but [Sam and I] are trying to unpack this idea and really show people that there was something before the Black Panther. One of our main problems was the power dynamic between our movement and the state in the U.S. The worst thing that our movement had to face was when we realized the role of the FBI in the continued oppression of our people. With J. Edgar Hoover as the head of the FBI, they were creating a counterintelligence program­­­ — the Co-Intel Program. And even though many of us knew we were being spied on, and we knew we were being infiltrated, we didn’t realize just how organized and mobilized they were. Therefore it was very easy to create divisions within our movement, which was quite disruptive to our continuity and success. We weren’t as impenetrable as people think. In hindsight, I think that it’s important in these intergenerational discussions for us to be honest, to be transparent, and to talk about the negative as well as the positive, which is why I feel comfortable giving the following analysis of BLM. The difference between our activism and today’s activism is the fact that BLM is a leaderless movement. Today you could say that you’re a member of BLM Montreal and once you express the reality of what’s happening to Black people here, you’re offered a mic and you’re instantly a member of BLM. There’s nothing wrong with that […] but what happens when a member’s perspective opposes yours? How will there be accountability when it isn’t an organized formation with internal accountability? That’s one of my concerns with having a leaderless movement. And to go off what Rosemari said about us wanting to unpack the idea that the starting point of the Black struggle is the Black Panther Party — I want to point out that the BPP did not start the revolution. There’s an entire historical lineage before that, and it’s very important that people understand that the resistance was always organized by Black folks. Always. That resistance took on many different forms, and many different organizations. Appiah: Exactly. You mentioned women, we know the Black Panther Party started with very little women in the beginning, near the cessation they were almost [at] 70 per cent. I wanted to ask you ­— how was the sisterhood back then compared to a group now like BLM? Mealy: It depends on where you were. Where and when. Absolutely. The early part, the early 70s, when the party started to disseminate, women played a key role. We were the backbone of the organization. We were dealing with the finances, running the liberation schools, organizing the health clinics, and did just about everything else. The image of the party was that of the macho male, holding a gun right? The beret on and confronting the police all the time. That image was true, but in some ways it wasn’t. Many of the women who organized in the Black Panther Party defined their activism and themselves in relation to the men. And sometimes, they came in the party only to maintain relationships with the men. But those of us who already had political experience were very conscious of that fact. And so we sought upon ourselves that we had to do some serious work around the whole question of male chauvinism and self-identity. One of the strongest people who really worked on issues of patriarchy within our movement was Afeina Shakur, Tupac’s mom. Another really important gender dynamic to point to in our movement is the question of credit: who is given credit, and for what? If you look in some of the old Panther papers, you will see the drawings and the artwork of our movement always being attributed to Emory Douglas. However, many of those images were done by a sister Panther — Carol Rucker. She never gets any credit for that, which I think really articulates the lived experiences of Black women in the organization. I don’t have a problem saying this publicly because I always tried to take on the role of identifying the way in which gender issues played out in our movement. I was called the women’s liberator in the Black Panther Party because I could really see how some sisters would be devastated when they would join our movement and their relationships would fail. They couldn’t function. Appiah: Did you resent them? Mealy: Oh no no no! That’s the whole point! It was an embracing of those women and dedicating time when we got together as women, where we really talked this thing out. In fact, some women, once they joined the party, realized their own power and their sense of self. They ended up terminating the relationships that they came into the party with. And that was really important. On another level it was constantly struggling against physical violence and abuse — our party had a strong position that deemed that type of violence to be unacceptable. It was a very strong and powerful stance, but that didn’t mean that in some places it wasn’t happening. In our own homes, and in our own households, […] we have our mothers who were victims of domestic violence and we didn’t really know it until much later. We have to deal with that, somehow. This was all representational of the movement’s political work. But once women started talking, and they felt empowered to be their own self, we started addressing these issues more. So yes, sexism was an issue, in all of the movements. Appiah: How did you [Sam] deal with that? The sexism in the party? When they were coming in, how did you feel? Anderson: At first I didn’t deal with it, but then I started to confront some of the brothers about their negative actions towards sisters. And often when you confront other brothers about their violent behavior, especially when you’re doing it as a young Black man, […] you get put down. But it’s important to build up enough courage to deal with that issue of confronting male chauvinism. But once it’s done, there’s no turning back. In some ways, it creates a domino effect, and more and more men started supporting feminist efforts to criticize brothers who were chauvinistic. Sometimes, you have to intervene in domestic violence issues. Mealy: It’s a contradiction to call yourself a revolutionary activist when your own behaviours don’t align. It’s a constant and ongoing struggle […] I mean if we take a look at the ‘Me Too’ movement which was started by Tarana Burke*, a Black woman in Alabama. She worked with young girls who were victims of sexual abuse. Nobody could hear her, but it was only when it started hitting upper-class artist[s] and white women from the arts world that the ‘Me Too’ movement became powerful. ‘Me Too’ started with us [Black people]. It started when we were sold on the auction block. So we have to constantly frame that in the historical context. Bishinga: The general public tends to only be exposed to stories of Black cisgender heterosexual men experiencing racism. Consequently it forgets other marginalized populations, like women of colour, in the discussion of racism. I am wondering what you feel it does to the movement? Mealy: It is not a contest about who is the most oppressed. What you need to do is frame it in the context of the origins of your reality. If we talk about Black people of African descent, you have to bring in the role of the slave trade and how it laid the basis for creating the social construct of what race is. It is a social construct, same as gender and class. You can come together in unity and have respect and understanding of each other’s culture and each other’s experiences. If you don’t do that, it allows a narrow nationalist perspective, which dismisses others people’s experience. Ultimately, that is what racism does. Racism dismisses the others. This will never go away. We are first perceived as Black. We got to be conscious of that. But at the same time, we have to understand that being united is really important. Just as white people have privilege that is immutable, men do as well. There’s still a long way to go, and we still have to continuously re-educate ourselves. In some ways, men have to decolonize themselves. That colonial mentality is so deep. We get back to the issue of patriarchy and it is difficult. Nobody is saying that you should lose your manhood. The concept of manhood itself is difficult — what is it? That’s where community is important because we shouldn’t be having these conversations by ourselves. We must have it as a community. For example, a lot of white people’s gut reaction to being called privileged is to say, “I had nothing to do with the slave trade.” In saying that, they forget that it’s not about having personal or economic stake in the slave trade, it’s about what white privilege allows you to have access to. And this isn’t rhetorical. This is real. And it’s important that we stop using terms such as “marginalized populations/community.” We aren’t marginalized. We have been marginalized, but we aren’t inherently so. Bishinga: We recently started a mentorship program called Supporting Young Black Students’ Careers in Health (SYBS). 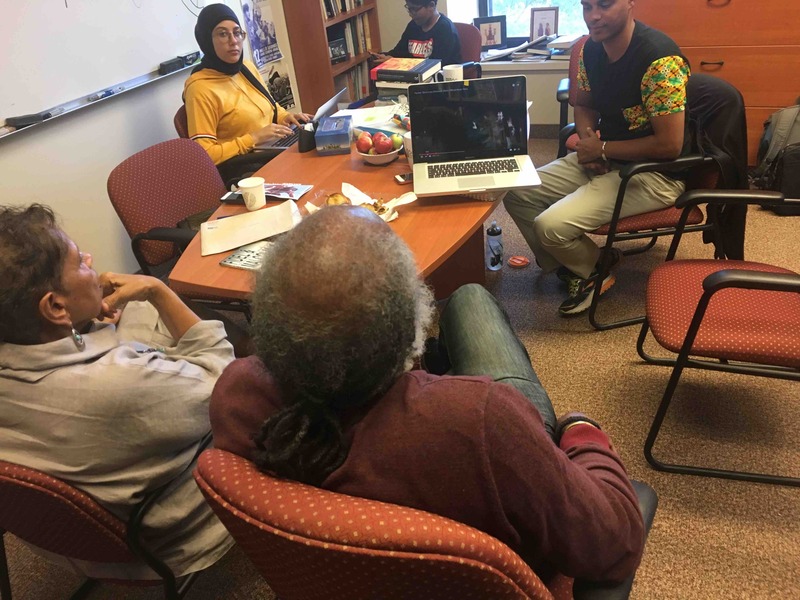 Our objective is to create a longitudinal pipeline to help young Black students to enter programs in healthcare professions, because Black students are underrepresented in most of those programs, especially medicine. Do you have tips or suggestions for us or for similar initiatives? Anderson: It is very important work and we must be intergenerational. It is important to set up a structure that allows us to keep that going, to keep our stories and our struggles alive. I think you need to keep in mind that you are institution-building. A movement that is institutional is a long-lasting movement. Once we institutionalize our struggles and our community, we eternalize them ourselves. Appiah: What do you think propels you into activism? For example, a lot of activist culture stipulates that if your activism is triggered by a sudden death, then it is disingenuous. Mealy: If it takes somebody’s death to get involved, it’s sad to say […] but whatever the force is that will energize you to say “I’m going to do something” is legitimate. On my part, what propelled me was the work I was doing as a a child development specialist. I remember going to Chicago and seeing the blood-stained mattress with Fred Hampton laying on it. […] I never went back to that job again. That’s what triggered my activism, seeing the blood. Appiah: When you guys were in the party, what did you see coming in the future? Anderson: Like we said, revolution was right around the corner. Every day was tumultuous. This vision of a socialist America and working-class solidarity, was just down the road in our lifetime. I think the vast majority of us who were active in that moment were a bit disillusioned. We thought we were going to get a revolution, but then we got the Reagan era and the fascist right-wing era. Some people gave up after that! Appiah: We just have one question left: how do you feel about being in the world today, and what advice can you give to somebody that wants to do something, but can’t be a full-time freedom fighter? Is there any advice you can say about that? Mealy: We are at the end stages of our lives where we aren’t going to be around for a lot longer. We don’t have the security that other people have, but you make do with what you have and find solace in it. Anderson: And in a community of like-minded friends, comrades. Mealy: Right, right. And you can develop those over the years. Anderson: You guys are in a different time now. We used to have a social movement that informed us, and the work we were doing. It wasn’t just national, but global in that period. It informed the youth. In the US, if you were a young Black person in the 1960s, activism was the hip thing to be involved with. It was in the air, but now it’s not. It may happen. It may bubble up on a global scale next year. We recognize that there are powerful movements right now. Mealy: It all goes back to having a world view and an understanding of what’s going on, and that you’re not alone. That’s what’s so important. You’re not alone in this. Anderson: And to remember that there are different levels of participation. We were deeply involved in a full-time way with many organizations for many years, and we had friends who are extremely supportive, but could not make that next leap. They were extremely supportive, they’d come out to the meetings and demos. They would give money. There are different types of support. *Tarana Burke started her activism in Alabama. She created a non-profit in 2003 called “Just Be.” It was aimed to be a place for Black girls, but three years later she renamed it “Me Too” because of the overwhelming sexual abuses and assaults that many of these girls had experienced. The “Me Too” phrase went on to become a worldwide movement. Burke moved to Philadelphia and participated in different kinds of activism — mainly contributing to the founding of different organizations.